Two years of grassroots fundraising and organizing are coming to an exciting and celebratory finale for The Compassion Project (TCP), an arts-based educational outreach program managed by MSU’s College of Education, Health & Human Development (EHHD). Beginning on April 16, approximately 6,000 locally made artworks will be displayed at five different locations around Bozeman in a collaborative effort to define, explore, and practice compassion. 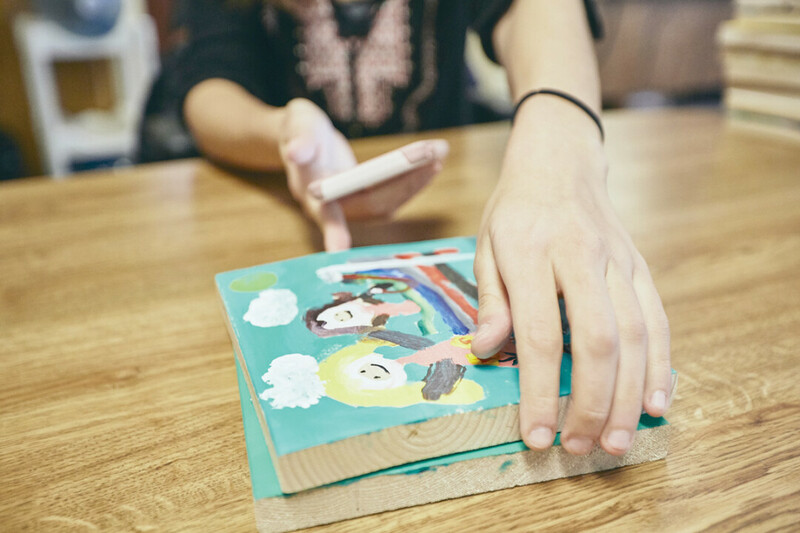 The artworks were created on 7-inch by 7-inch blocks of wood each by a unique individual and will be displayed in an enveloping, mosaic-like pattern at each location. 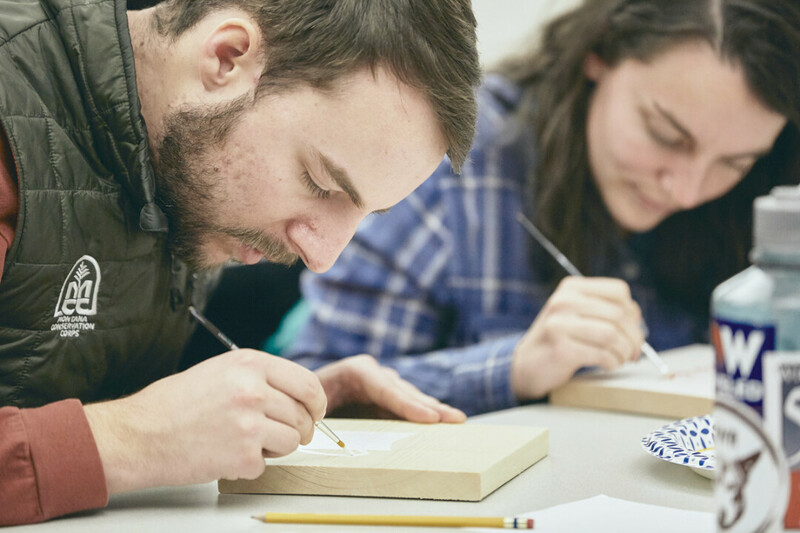 The 6,000 pieces of artwork can be found in the Weaver Room, West Wing, and upstairs of the Emerson Center for the Arts & Culture, with other installations at Sola Cafe, Red Tractor Pizza, Fork and Spoon Homestyle Kitchen, and the Bozeman Public Library. Banners can be found at each exhibition location with directions on how viewers can interact with the artwork via a mobile app created by MSU students in the Software Factory. The scope of this project has been made possible by countless hours of volunteer work by over 30 core volunteers, teacher dedication to the project at every school in Bozeman as well as Livingston and Belgrade, and through the incredible generosity of the community as a whole. Through grants and sponsorships, as well as support from Give Big Gallatin Valley, The Compassion Project raised over $50,000 to support this effort. “The outpouring of support for this amazing project from teachers, parents, TCP Crew, and other community members is what makes this project special. It speaks to people on a different level given the current division we are seeing in the world. Compassion is something we all need, and something we all can all strive for,” states Kayte Kaminski, Director of The Compassion Project and Assistant Dean of MSU’s College of Education, Health & Human Development. Kaminski originally witnessed a similar project in LaCrosse, Wisconsin in 2014. Deeply impacted and inspired by the project in her hometown, she thought it would be a positive endeavor to bring to Bozeman. In response to the national sense of division, Kaminski approached the Dean of the College of EHHD, Alison Harmon, in spring of 2017 with a vision for the project. Within a couple of months, a team of local educators, artists, and volunteers came together around an agreed definition of compassion; compassion is mindful support, relief, and genuine human kindness for others, ourselves, and our environment. The team began crafting an arts-based curriculum for teachers and community leaders to address the prevalence of bullying and divisiveness. The National Bullying Prevention Center reports over 20 percent of students are bullied in schools and the Center of Disease for Control indicates bullying puts children at increased risk of poor school adjustment, trouble sleeping, anxiety, and depression. While there are many existing resources and structures in place to address behavioral and interpersonal issues, TCP’s curriculum is especially intentional about clarifying and reinforcing positive behavior, rather than dissuading negative behavior. “Given the presence of bullying in and outside of schools across the United States among children as well as adults, cultivating compassion, perspective-taking, and social-emotional learning skills is an absolute necessity if we are to work together and tackle larger problems,” states Tia Goebel, current Assistant Director and future Executive Director of the project and organization. TCP’s main focus has been serving young learners, but additional outreach included community workshops for adults and families at host sites such as MSU, Keller-Williams Realty, and Bridgercare. There are several opportunities to further engage with the project through an event series while the artwork is displayed. These events begin with “Finding Your Compassionate Voice” on April 15, 2019, at the Emerson Center for the Arts & Culture. During this two-hour event, a series of local storytellers will share their struggles with compassion, followed by an in-depth panel discussion on compassion’s limitations and challenges. Included on the panel is writer, pastor, activist, and author of Hope and Other Superpowers, John Pavlovitz. Featuring musical performances by Permafunk and the Montana Women’s Chorus and a sneak peak of TCP’s art installation, this event may leave you with more questions than answers, but a deeper understanding and reflection. Other events include an opening for TCP’s partner artist exhibition on May 10, and the Art Walk and Partner Artist auction on June 14. For more information, please contact Kayte Kaminski, katherine.kaminski@montana.edu, or visit the TCP Facebook events page (www.facebook.com/thecompassionpject). 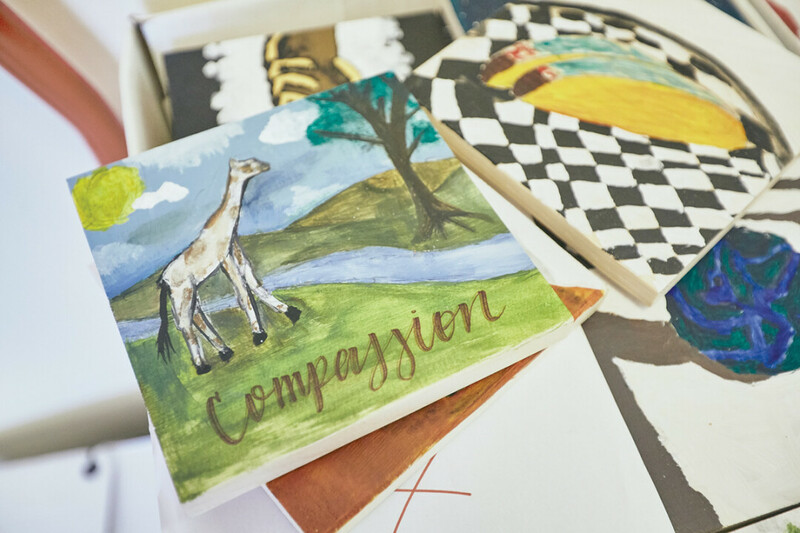 Together with The Compassion Project’s core team of educators and supporters, Goebel is working to establish The Compassion Project as a separate, nonprofit organization. Goebel envisions the new organization providing resources and support to schools and communities across the state of Montana as well as the nation in order to deepen the understanding and practice of compassion. Tia Goebel is a driven and empathetic leader passionate about building more livable, equitable and sustainable communities. She is currently engaged in this work as the Assistant Director and future Executive Director of The Compassion Project. 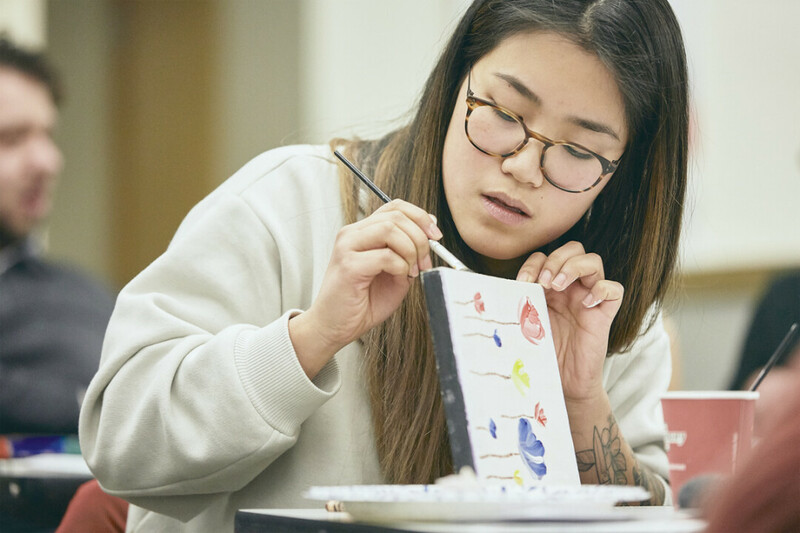 Tia holds a BA from Montana State University in Interdisciplinary Studies where she designed her own degree around the intersection of art, art history, and nonprofit management, which culminated in a capstone research project on creative placemaking. Tia has experience working with vulnerable populations and has worked to address issues in areas such as housing, mental health, education and gender equality. Although originally from South Dakota, she ended up finding herself at home in Montana's mountain habitat. When she is not working, you can find Tia reading, drinking tea and playing outside. Tia is an artist and will begin work on her masters in art therapy in the next few years.